Peppermint Bark 1 package white chocolate chips (I buy them from Trader Joes where they only cost $2.29); 2 tsp peppermint extract, and 20 mini candy canes (about half a package; I buy the mini kind---see picture---because you can crush them, snip them open with a scissors and pour. 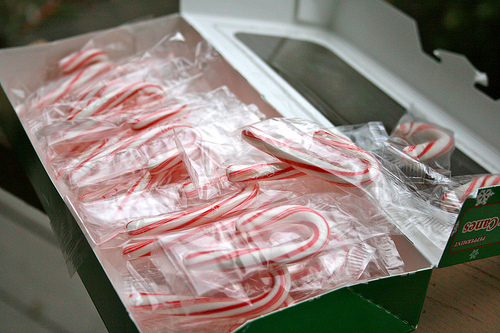 The large candy canes are a pain to unwrap!). Put white chocolate chips in heat-proof bowl. Microwave for 40 seconds. Remove and stir. Repeat (microwave another 40 seconds and stir to blend). At this point you may be able to stir the chocolate to a smooth consistency. If not, microwave another 30 seconds and stir to blend (be careful not to burn the chocolate!). Stir in extract, then crushed candy canes. Spread on tray about 1/4 inch thick---I always give the tray a good 'wham, wham' on the counter to smooth out the surface of the bark. Pop in the fridge for 20 minutes to help firm; doesn't need to stay in fridge. For giving: break into pieces, pile in little cellophane bags, wrap with curly ribbon and attach a nice note! 2. Chipolte Candied Pecans. I recently fell in love with these pecans. I made a batch of them, and tucked most of them in parchment lined tins. Though some I kept to chop and top my holiday baked brie [appetizer]! Eat them as-is or add them to salads, sprinkle on ice cream or top your sweet potatoes! 3. Snowball Cookies. Its THE perfect time of year to pull out the powdered sugar and roll your cookie balls in confectionery 'snow'. Snowball Cookies are a far cry from healthy---so consider them the appropriate holiday treat and indulge! What do you bake to delight your friends---and thank people---during the holidays? Do you have a favorite Christmas Cookie Recipe?